Friday was the 10th day of the 2018 legislative session with Senate now listing 333 bills introduced, and the House (with nearly three times the members) having 739. It’s a small comfort that the majority of these will never make it out the ‘sausage grinder’ that is the legislative process. One of these we’re hoping to see on the scrap pile is SB 252 “ …requiring all schools provide an elective course on Hebrew Scriptures, Old Testament of the Bible, or New Testament of the Bible.” Besides being blatantly unconstitutional, our schools are already having a hard time without adding religious ‘electives’ to the curriculum. This bill was lampooned in the first 2018 edition of ‘Wonk’s World’, a collaborative Facebook live broadcast we’re doing with the American Friends Service Committee’s Rick Wilson and Lida Shepherd. Watch for a new episode every Friday going live at 2PM. Of course there is much more serious damage being attempted by the ‘true believers’ who follow the dittohead conservative playbook this session. 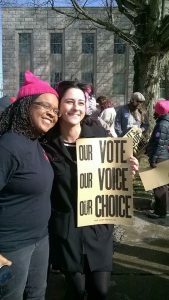 WV-CAG has joined WV-FREE’s #HealthNotPolitics campaign with other social justice groups including the National Association of Social Workers-WV, West Virginians for Affordable Health Care, an ACLU of WV to oppose HB 4012 which is attempting to take away reproductive health choices from women on Medicaid. We believe people deserve safe health care no matter how much money they make. This bill is in House Health and Human Resources committee. Watch for more details following the official campaign launch on Wednesday. As alluded to last week, the Governor’s bill to allow logging in our state parks is now official. SB 270 and HB 4182 both seek ‘limited’ logging to ‘improve’ our state parks and forests. Gossip has it that this bill is really the brain fart of WV Secretary of Commerce, Woody Thrasher, spawning jokes about ‘Woody’ thrashing our state parks. Our former director, Norm Steensta, commented that our state parks should be considered like “Tree Zoos” that is – a place for folks to go to appreciate and experience climax forests. State parks should not to be considered just another extractive commodity. Click here for the WV Environmental Council’s action items on this stupid idea. For more information, the WV Rivers Coalition has a good FAQ. While you’re there, sign up for their alerts too! 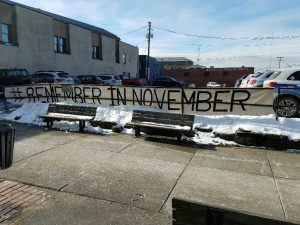 Saturday and Sunday saw several West Virginia events commemorating last year’s historic Women’s March. 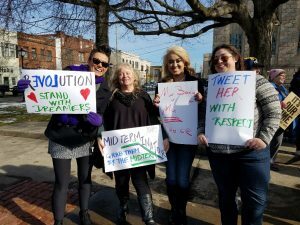 Beckley kicked things off with a rally and march organized by several local Women’s Huddles (and co-sponsored by WV-CAG) with the theme “It’s Our Time.” Alexandra Gallo, our Outreach and Development Director, was one of their featured speakers. See news coverage here. 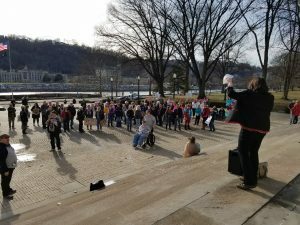 A quick trip back to the Capitol steps got us there just in time for the Impeachment & Voter’s Rally conceived by the WV chapter of the National Organization for Women (NOW) with lots of help from Valerie Woody from WV-CAG. The Charleston Gazette-Mail ran this story. Short videos of both events are on our Facebook page. 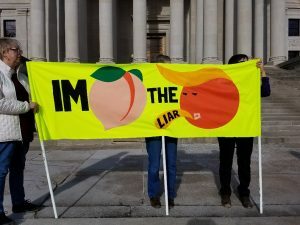 In Morgantown on Sunday was yet another rally by local activists. This was an inspiring day showing that our movement(s) are alive and well. #RememberInNovember! Used to be folks faced hunger and starvation if they couldn’t find work. Our legislature seems to want us to take us back down that road. HB 4001 contains several measures that punish families who rely on SNAP, Medicaid or TANF, and contracts with a private, for-profit vendor to verify eligibility. The bill’s ‘work requirements’ are proven by DHHR’s own pilot program to be little more than an excuse to kick people off of these programs. This bill would make work requirements statewide and pay millions to a third party administrator. Our Children, Our Future (OCOF) and West Virginians for Affordable Health Care are leading the charge opposing this mean spirited bill. It may come up in the House Health Committee this Tuesday January 23, which is Kids & Families Day. You should come if you can! See OCOF’s Action Alert elsewhere in this update. Lots of news on the political scene this week: House Speaker Armstead announced he will not run for re-election opening up his 40th District (Kanawha County) seat in the upcoming election, and his top leadership position next session. His departure could open up movement on many issues that ultra conservative Armstead has blocked for years depending on who takes the helm in the House. Huntington Mayor Steve Williams declined to file as anticipated for the 3rd District Congressional seat that is being vacated by Representative Evan Jenkin’s run for Joe Manchin’s US Senate seat. However, Delegate (and former State Senator) Shirley Love, has filed to challenge apparent front-runner and current State Senator Richard Ojeda this week, so contested primaries in both major parties are now on for 3rd District. The filing deadline for all state candidates is this Saturday, January 27. More on Who’s In and Who’s Out next week. Fair Maps for West Virginia? Speaking of elections, an important part of the process is redistricting, or redrawing the boundaries of legislative and congressional districts. Redistricting will happen after the 2020 Census, and the current redistricting process allows legislators to draw that govern their own elections. Two bills are moving in the House of Delegates related to redistricting. Earlier today the House of Delegates passed a bill passed a bill (HB 4002) the mandating that the House go to 100 single delegate districts after the 2020 census. While there are good arguments both for and against this proposal, as many delegates pointed out during the debate, what’s more important is who’s drawing the districts. If we want to take politics out of the process, and make it more fair and transparent the solution is to establish an independent redistricting commission. A separate bill (HB 2383) to do just that is now under consideration by a House Judiciary Subcommittee and probably has a good chance of passing. More from the Gazette-Mail here. Stay tuned! We hope you are! Please count yourself ‘in’ the ranks of the active citizens who are members of WV Citizen Action. If you haven’t done so, click here to send in your membership and become part of the revolution overturning rule by the 1%. You’ll be glad you did! 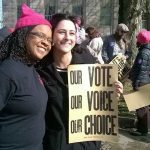 I did not know about the NOW Women’s March this past weekend I don’t do FB. Cannot CAG have sent out a notice? Or WV FREE? I belong to both.